Your appointment book is as flexible as you are. 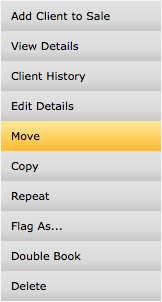 See how easy it is to move and copy appointments with the handy Clipboard! Moving or rescheduling appointments using the Clipboard. In your Appointments page, start by locating the appointment you wish to move, and click the clients name on the appointment. In the pop up Visit Details window, select Move. The appointment will disappear from the operator column, and display over on the right side panel in the Clipboard. Choose the new date using the Calendar icon or the Jump icon up on the top right of the appointments book. Once you've found your new day, click the time slot in the operator column where you would like to move the appointment to. 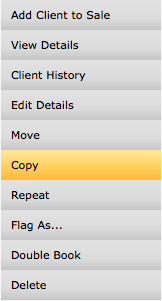 Copying or rebooking appointments using the Clipboard. One way of rebooking an appointment, is to copy the appointment and paste it back down onto a future date. You can copy and paste the appointment onto a new day, without affecting the original appointment. Click the clients name on the appointment and select Copy. On the right side panel, you have enabled the Clipboard. Your appointment(s) will be waiting over there until you are ready to paste them back down onto a new date. Choose the new date using the Calendar icon or Jump icon. 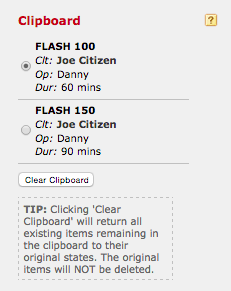 Click the time slot in the operator column where you would like to copy the appointment to. The appointment has been copied, and the original appointment will still be in it's original spot.